Here's a quick update for you, folks. 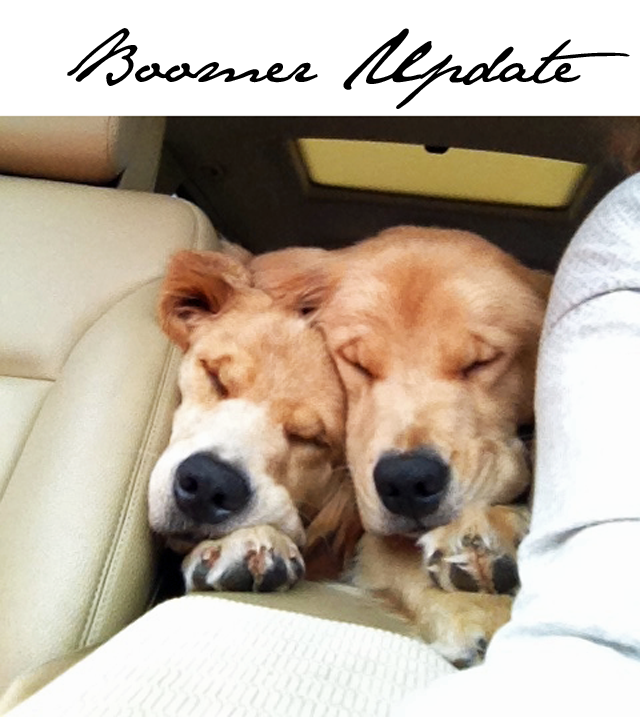 Boomer the golden retriever and his new nutty buddy Brody have truly become two peas in a pod. The two wrestle all day, when they're not digging up mom's plants or stealing antiques to bite to bits. Then, when the sun goes down, the duo fall asleep together and it all becomes a blur of golden fur. Momma goose was making the drive from beach house to city house and snapped this priceless pic of the two sharing a special moment in the car. That's the gorgeous Boomer on the right and the newbie Brody on the left. Apparently, they are the perfect backseat buddies. I'm headed home in July, after a major move here in London, so I'll be bringing you regular updates of the two in action. I can't believe it's been five months since I've seen my beautiful Boomer. Hope you don't mind if I overwhelm you with pictures of the handsome teenager. It's amazing how much has changed in that last year, not just with Boomer, but more on that later.